Present state: Demolished - no evidence of the station remains. 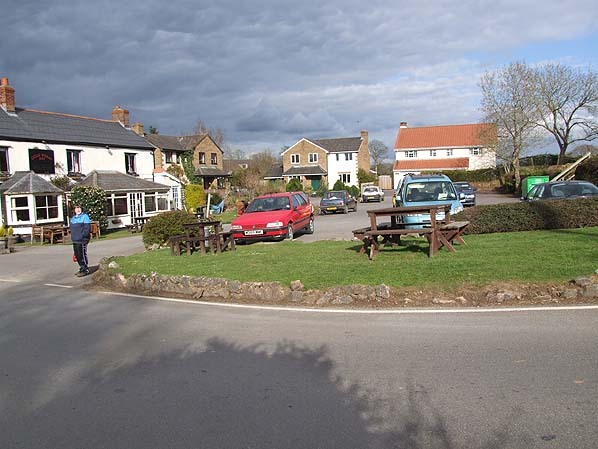 The adjacent Culm Valley Inn has a display of photographs showing the station. 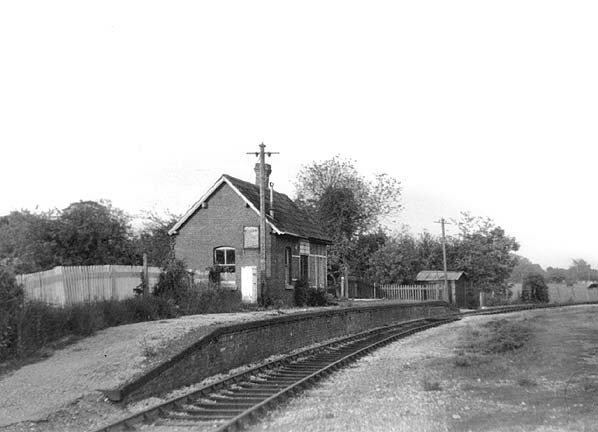 Culmstock station had a single platform with a loop. The goods yard was opposite the passenger platform and had two sidings accessed from the loop. One of these served a loading dock with cattle pens the other served a timber goods shed. The loop and siding were lifted by July 1965. The Culm Valley is closed in by high ground on three sides and in the early 19th century was poorly served by roads cutting the valley off from the markets for its produce. To improve this situation, landowners and farmers eagerly subscribed to a project to bring a rail connection to the valley; the easiest access into this isolated area was to follow the course of the River Culm. branch from a junction with the then broad gauge Bristol and Exeter main line at Tiverton to a terminus at Hemyock. Agricultural traffic was the main expected source of revenue, but there was also a local brick industry and locally quarried flint for road building and a better means of bringing in coal was also desirable. The Culm Valley project was one of the earliest successful applications to build a 'light railway' as defined in the Railways Regulation Act of 1868. This stipulated the limitation of loads to eight tons on an axle and of speed to 25 mph It was considered, however, that a maximum speed of 16 mph would be adequate for the nature of traffic the line would carry and it was hoped to build the 7 1/4 mile line for a little under £30,000. The Act received the Royal Assent on 15th May 1873. The Culm Valley was the first major line engineered by Arthur Pain who went on to construct several other light railways, notably the Southwold and the Axminster & Lyme Regis. The chairman of the promoters was a director of the Bristol and Exeter Railway so even before construction was sanctioned, the B & E agreed to work the branch for 50 per cent of gross receipts. It was also agreed that the Bristol and Exeter could buy the line outright after five years. The line was planned to follow as far as possible the boundaries of fields and the banks of the river meandering from one side of the river to the other with wooden bridges and a succession of sweeping reverse curves with check rails making it virtually a three rail line. Construction started early in 1874 with completion expected by the end of the year. Labour was cheap and abundant and an added boost was given to the lines prospects by the decision of the B & E to extend mixed gauge westward from Taunton, which would allow the transfer of rolling stock to and from the main line at Tiverton Junction. By the end of 1874, however, only 2 miles 2 chains had been completed which started a series of delays that increased the construction costs and put back the opening date. At this time the Bristol and Exeter Railway had entered into negotiations for union with the Great Western Railway; as a result, the G.W.R. took over its former partner on 1st January 1876 and with it the responsibility of working the branch. The line eventually opened £20,000 over budget on 29th May 1876 with a train composed of Bristol and Exeter stock and hauled by a locomotive specially built for the branch in the Bristol and Exeter workshops at Bristol. There were intermediate stops at Uffculme and Culmstock. Initially there was much local support for the line but the Great Western didn't have the same enthusiasm for its partnership with the Culm Valley as it's predecessor. The mixed gauge had reached Exeter in 1874 and the first regular working of a 'narrow gauge' goods train west of Taunton began in March 1876, just in time to give the Culm Valley through freight facilitates from the outset. 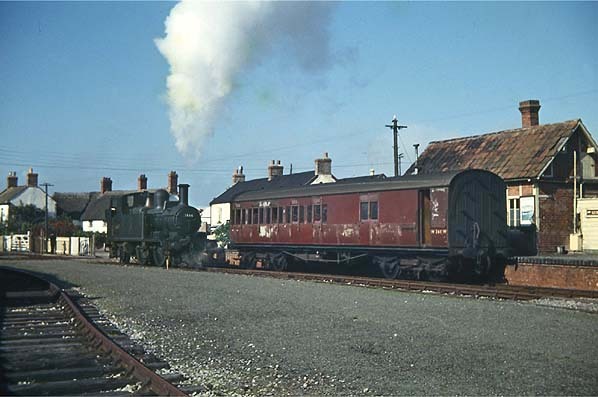 Two standard gauge 0-6-0T locomotives were built for the Culm Valley Railway, they were operated on the line until 1881 when they were replaced by two 2-4-0T locomotives which came from the South Devon Railway. Freight traffic developed far more successfully than passenger traffic and recognising that the resources of the valley in this direction were limited, the directors soon persuaded the GWR of the need to attract passenger excursions from outside the area. They believed that more tourists could be induced to visit the Wellington Monument, north of Hemyock station. There were, however, no provision for refreshments at any of the stations although this was eventually rectified at Hemyock when a refreshment room was opened in 1878. However this and other improvements introduced by the G.W.R. failed to bring any new tourist trade and in fact passenger numbers declined. The Culm Valley directors were not satisfied with the way the Great Western Railway operated the line and in 1879 complained that traffic from their area was being taken by road to Honiton for transport by the London & South Western Railway. The company was now in serious financial difficulties and entered negotiations with the GWR to purchase the line. At the same time, they also considered ways of increasing revenue including an extension eastwards making Hemyock a link in a cross country route between the fashionable resorts of north-east Devon and Dorset; this didn't materialise. The Tiverton and North Devon Railway was opened from Tiverton to Morebath Junction (Dulverton) on 1st August 1884 and two days previously the former Bristol and Exeter 44-mile branch to Tiverton was converted to narrow gauge which gave villages in the Culm Valley much greater access but by 1879 the company's days were numbered and in 1880 the GWR finally agreed to purchase the line. The transfer took place in April 1880 at a price of £33,000, which was less than the cost of building the line. became profitable for freight. A textile firm was encouraged to open beside the railway and the Culm Valley Dairy Company opened its new plant at Hemyock in 1886 producing cheese and butter and supplying churns of raw milk to London dairies and bottling plants, without this new industry the line couldn't have survived. kind. In 1922 there were four trains a day and those during the middle of the day were usually of mixed stock with two passenger coaches and five or six wagons. In an attempt to attract more passengers two halts were opened at Coldharbour in 1929 and at Whitehall in 1933. After nationalisation British Railways continued to run a passenger service but was forced to use a pair of gas-lit ex-Barry Railway coaches since standard stock wouldn't take the sharp curves, normally one of the pair sufficed. There were still four daily trains with an additional short working to Culmstock but with the increasing popularity of the car after the war it came as no surprise when closure to passengers was announced under the Beeching cuts. The line lost its passenger service on 9th September 1963 but remained open for general freight traffic but this was short lived as much of the goods traffic had also gone over to road transport and the freight service was withdrawn on 6th September 1965. 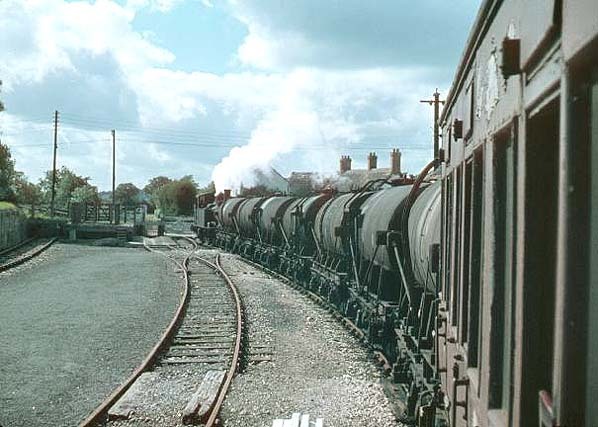 From that date, Hemyock Station closed but the line remained open with milk tanks to and from the dairy in Hemyock providing most of the later traffic; this ceased on 31st October 1975 with the unexpected closure of the dairy. Tickets were printed for a final passenger train along the line but safety regulations imposed by the Department of the Environment prevented the trip from being operated with passengers, so the line closed without ceremony. The line was quickly abandoned during the construction of the M5 just west of Tiverton Junction when an arch that was being built to allow the line to pass under the motorway was filled in removing any chance of the line ever reopening. Much of the Culm Valley line is now part of a network of river paths including the Uffculme Railway Path. In February 2008 there was a proposal for reopening the scenic line for tourist traffic and this is currently under discussion. Culmstock goods yard in August 1962 looking west. The mixed train train is standing in the passenger platform. The level crossing can be seen beyond the locomotive. 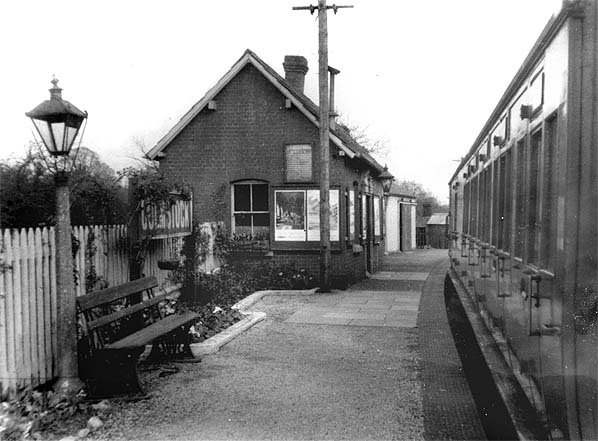 Culmstock Station in July 1965 two years after closure. Culmstock lost its freight service at the same tim e as the passenger service and the siding visible in the picture above has been lifted. 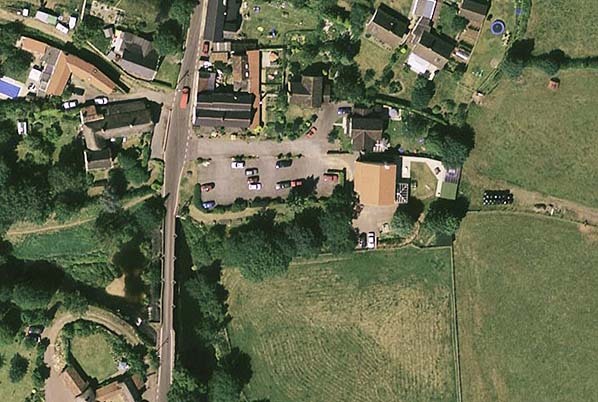 Aerial view showing the site of Culmstock Station. The line can be seen coming in from the right. 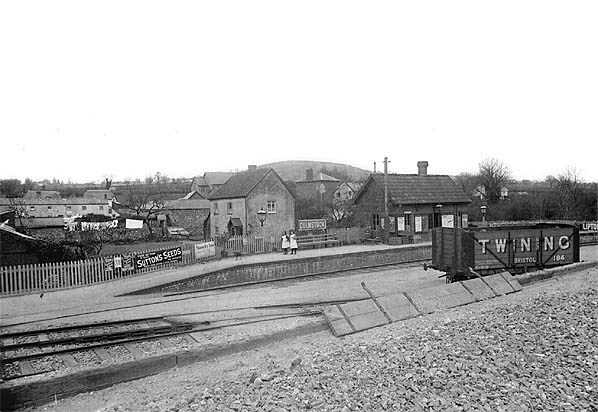 The station was sited in what is now the Culm Valley Inn car park in the centre of the picture.